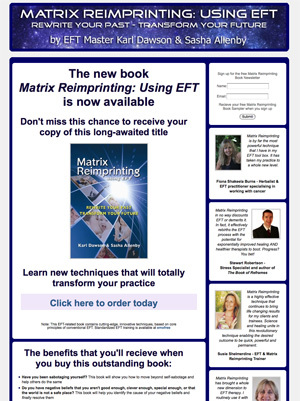 In the second of our landing page makeovers, I’m going to look at a landing page designed to sell a book called “Matrix Reimprinting: Using EFT”. In our first makeover (aimed at providing some advice to small businesses), I used the Conversion Marketing Scorecard to analyze a landing page for a Phoenix language school. Here is the landing page for the Matrix Reimprinting Book. Clearly the point of this page is to sell the book. They are using email as their primary marketing channel, using an image of the book in the email. The customers receiving the email are in a targeted niche who hopefully understand the subject matter. Establish Baseline Score: Using the interactive Conversion Marketing Scorecard, I will do a quick analysis of the page to see how well it scores. Points are awarded based on 40 simple questions related to landing page design standards. Analysis of Scorecard Results: Create TO-DO list of items to look at, based on the Scorecard questions that received a negative response. I’ll take a quick informal run through each of these. Top Improvements: Finally, I’ll provide a list of the most important items to be addressed. TIP: Remember that when you are running through the scorecard, if the question doesn’t apply to your landing page, you check the box. The score you get at the end is based on uncovering how good your page is in relation to how good it “could” be according to the scorecard. This means that a score of 30 on one page, doesn’t make it a better landing page than one that scores 25. It just means it’s doing a good job based on it’s own merits. the only time you’d compare scores is on the same page before and after making optimization changes. The Matrix Reimprinting Book scored 29 out of 40. This places the landing page in the “Better Than Most” category. This is a play-by-play of my impressions of the page. Recommendations for dealing with these issues are presented in the final step. Could a stranger understand the purpose in 5-10 seconds? I’ll use myself as an example here. My first reaction was – oh, this is about a book. But what is Matrix Reimprinting and what is EFT? The visitors to this page are generally in the know, but you never know who will see your landing page and where your next potential customer will come from. Customers are generally split into two segments: first there are those who are aware of you, your brand or your product and subject matter. The second group are people who are not aware that your product or service could benefit them – they need to be educated. Does your page message have the clarity of an elevator pitch? No. It’s simply too long for anyone to be able to consume an understanding of what is being discussed in a short amount of time. A good way to start improving this area would be to look over your page and split each part of the message into a chapter title. When you have all of these elements listed you will know what your page needs to communicate, and can begin writing a short-form version of your product or service “story”. Does your landing page explain how your product/service is unique (USP)? It might, but I didn’t read through every bullet point on what is a very long page. If there is a uniqueness to the book or author, make it clear. I just went and scanned the page again, and found the author information. To me the information contained within this provides the USP – as no author is the same and this information should be amplified. Do you explain how easy it is to proceed (30 seconds, or 3 simple steps)? I questioned whether to include this one as it’s not 100% relevant. But I think that you could benefit by mentioning the trust factor and ease of payment options you offer. Google Checkout and PayPal are respected brands that will benefit your sales – but don;t wait til the last minute to mention them. Use phrases such as “secure checkout with Google or PayPal” beneath the “Buy the book now” CTA. Do you explain the value or size of your giveaway (discount, eBook pages or $ value)? You don’t offer a giveaway as a primary offer, but you do present one with your newsletter sign-up. However, you don’t say what it is or how much you get. Explain that the free book sample is Chapter One, or 11 pages etc. Does your landing page appear to be professionally designed? This is a very subjective question. And in my mind the header image and typography take some points away from the trust factor. One might be inclined to assume that a book with a reputable publisher behind it would have a professionally designed page – indicating that this might be a self published book. Again, these are first impressions that could be right or wrong – but on a landing page first impressions unfortunately count for a lot. Are you providing a sample (preview of first chapter etc.) of your giveaway, if applicable? You are offering a sample portion of the book in return for a newsletter subscription. A great test would be to try providing this sample chapter/portion without the form – to see how that affects conversion rates. You could still use the form for newsletter subscriptions, just remove the barrier to the preview. Is your CTA in a prominent position near the top of the page? No. The secondary action (newsletter sign-up) is in the prime spot, but the main “click to order today” CTA is about 2 pages down (on an average monitor). On a long landing page like this it’s important to repeat the call to action at regular intervals on the page – which is being done well. But the primary CTA is too buried and the prioritization of CTA’s is reversed. Do you use highly contrasting colors to make the CTA pop out? The CTA is on a soft pastel colored background and doesn’t stand out as a clear action button. Is your secondary CTA (safety net) close to, but less prominent than, your primary CTA? No, in this case, the safety net CTA (the newsletter sign-up) is presented as the primary option on the page. It should be relegated to a less prominent position. The primary goal here is to buy the book. Your CTA for this is the recurring link that directs visitors to the purchase form. Either bring the call to action for this right up to the top-right where the newsletter form is currently placed, or make the book cover and description area smaller to allow the CTA to appear above the fold. If you want to make a secondary offer (the newsletter), keep it further down the page and clearly suggest it as an alternative. This page does a good job of repeating the CTA as the page grows, however, it doesn’t stand out due to the weak color palette. Each call to action should be designed as an element that feels clickable like a button. Provide some more whitespace around each instance of the CTA and use a color in polar opposite to the rest of the page design. If you have a snippet/portion/chapter of the book in a digital format, then offer it up for free. This produces an immediate sense of trust and transparency. Showing that you’re not afraid to let people read part of your book tells visitors that you believe in your product. Consider the brick and mortar equivalent of buying a book. You wouldn’t prevent a browser from picking up your book to read a few pages would you? Be generous, and open about your message. If you believe in your writing, let people enjoy a portion of it as an enticement to buying the whole thing. The safety net CTA is a secondary action you want your customer to participate in if they decide NOT to act on your primary conversion action. In this case it’s the newsletter subscription. I feel that you’ll be able to increase your primary conversion rate by offering the book preview without having to complete the form (as in the point above). By including this newsletter form you are enabling visitors to stay within your sphere of influence for a conversion at a later date. In order to entice them to subscribe, I would provide a short description of what to expect from the newsletter contents. Using copy such as: “Interested in learning more about Matrix Reimprinting?” would be a relevant tease to leverage the non-qualified customer. This page uses Google Checkout and PayPal. Track down their official logos and proudly present them on the page to increase the sense of trust and familiarity in your customers. I get the sense that the authors are important for this book. Bring them up into the sidebar near the top of the page. With a book in the physical world, you can quickly flip to the back of the dust jacket to see a photo and bio of the author – make it that simple on your landing page. The fact that one of your authors is one of only 29 EFT Masters in the world is worth shouting about. Position both authors as the authority they are by giving them a prominent position on the page. Currently they have equal weight to the testimonial bios which is a travesty to their talent and efforts. In line with restoring this balance, you may want to relegate the other testimonials to a less prominent area, and perhaps categorize them according to their relevance to the field. There is a lot of required reading on this page. I can’t deny the success of this page (20% conversion rate thus far). But what I can do is suggest you cut the amount of text on the page by about 75%. Strip it all out. Leave only the essential elements. For no other reason than an exercise, read every sentence and ask yourself if it is absolutely necessary. If not, rip it out and see where it takes you. Consider it a cleansing. Testing this idea is key. Perhaps your customers like to spend a long time reading about the book, concept, testimonials before buying. But maybe they don’t. There aren’t too many things wrong with this page that can’t be fixed using the guidelines above, and I’d love to see what happens as a result. Make your CTA stand out more and put it above the fold. Bring the author bios up into the right column. Reduce the amount of text a significant amount. Provide a clear link to a preview of the book. This rough layout illustrates what I’m referring to with regard to the top half of the page. It presents the core information required to understand the page, and offers up a link to a free preview.